I think your key point is at the end. There are two goals we can pursue here with 40 DfL. One is ecumenism, and one is ending abortion. 40 Days for Life is about the latter, while ensuring openness to all denominations. I know we all agree that is the guiding principle. How exactly to achieve it, I am not sure. What I am sure of is that discord as the result of such a discussion is of Satan, and whoever gives himself over to despair of unity because of such disagreements has lent an ear to the Father of Lies. But I want to take that even further and tell you all about something that has been on my heart for some time now. It is another pro-life strategy, and it seeks to be guided by God’s methods instead of man’s. Some have pondered “What would Mary want here?” But we need not guess at it. She has told us. I must preface this by pointing out that it seems I have been more persecuted recently by Catholics for doing Catholic things than I have been by non-Catholics. I go evangelizing door-to-door and have been greeted with warmth even by Muslims who appreciate my care, while I am condemned by Catholics for my “proselytizing and pushiness.” I pray something Marian at an event with non-Catholics and am complimented by Protestants for my Faith, while I am condemned by Catholics for “pushing what others think to be idolatry” . I speak of the unprecedented urgency, depravity, and apocalyptic nature of our times (merely quoting claims in many approved apparitions) and I am thanked for pointing this out by even the lost sheep; the dissolute, the homeless, the sinners: protestants, Jews, and Muslims alike; while many Catholics chastise me saying “Stop being distracted, times have been bad before, everyone dies anyway, you’re being fanatical and people don’t like that.” I speak of the errancy of Darwinism and the fact of Adam and Eve, and Catholics roll their eyes at me, explicitly or implicitly saying that I ought to be more concerned about potentially offending modern scientists than offending God; while the uneducated youth on the streets are happy to hear me proclaim the fact that even they know to be obvious: we are not the mere descendants of apes. I am not seeking sympathy! I say these things only to point out that the great tragedy of today is not the persecution we receive from without, but the wretched tepidity and lukewarmness from within the walls of our own Catholic Church. We are like a knight in full armor cowering in a corner afraid to engage a small rabid animal. Our disastrously weak faith is demonstrated by our hesitation to proclaim the full Veritatis Splendor (Splendor of Truth) to all. Human wisdom says water down truth so it is less offensive. Divine wisdom says “Blessed is the one who takes no offense at me.” (Luke 7:23) Divine wisdom proclaims Truth in all its beauty and majesty and splendor, and permits those who cannot accept it to walk away (John 6:66). One woman I spoke to while going door-to-door was once a Protestant and told me about how she converted to Catholicism because when she had a daughter, she wanted to raise her in a faith with more ritual. Thanks be to God she did not run into a modern Catholic who uses that pathetic “lowest common denominator” strategy, tip-toeing timidly around and making sure to pretend we are really not much different! This woman had fallen away from the practice of the Faith for quite some time, and said it was a sign from God that we showed up at her door when she did, and told us she would get back to Church. To the point: I am striving to take my orders from Heaven. Heaven speaks through the Magisterium, yes, but Heaven also speaks directly. Our mother, who is the mother of all, the greatest creature who will ever exist, and the Queen of all Creation, has been perfectly clear that SHE is the one in charge of our current apocalyptic struggle. Christ has saved her for these times, and she is our commander. The strategy I suggest seeks to place itself completely under the mantle of Mary. “So it is a Catholic campaign, then” you may say to me. It is not! It is far more inclusive than even those on the “inclusive” side of this debate wish to position themselves. It is welcoming of all true believers, for it seeks to hurl at Satan, as one massive attack, all those prayers that God hears (and these are not only not limited to Catholics’ prayers but are also not limited to Christians’ prayers); prayers directed against a common enemy. What great allies against the Culture of Death I have met among non-Christians: Muslims, Jews, Mormons, Jehova’s Witnesses, and those who believe but are still seeking a Church! Why should we neglect to unite their prayers with ours? If you ask someone “do you believe in God?” and his response is an unqualified “yes” (not “yes, but…” or “yes, as a…”), and he recognizes the same enemy we recognize, then his prayers ought to be united with ours, through Mary. She has made it clear that under her mantle Catholics, Orthodox, Protestants, Jews, and Muslims are to unite against Satan. Do not accuse me of religious indifferentism! Daily I hope and pray and work so that all may become Catholic, where alone abides the fullness of Truth. But there is no time to wait for that to happen. Only the most arrogant of souls could claim that God does not hear the prayers of any non-Christians. So if we are to exceed the walls of our own Catholic Church, let us not arbitrarily limit ourselves to non-Catholic Christians. Abandon your fears, your concerns, and your hesitations! Our own devices will not bring about the Triumph of her Immaculate Heart that she promised us. She will; through our response to her call. She has told us we are to pray together; not just Protestants and Catholics but all believers. She has told us that the Rosary is not just for Catholics. Reject her orders at your own peril, devout soul! Fear Judgment Day as well, as we all ought, but consider that the rejection of a mother’s love may be more detestable to Him on That Day than all the sins against purity and temperance in the world. How exactly to go about with such a strategy? I certainly have not worked out all the details, though I will continue to think and pray about this. Remember also, devout Catholic, that outside those very few truly faithful, obedient, orthodox Catholics; we do not have any complete allies in this fight. Even the more conservative Protestant Churches have neglected to condemn contraception, which is at the heart of this Culture of Death- so you will be doing no good in reciting to me a list of evils contained in Islam, Mormonism, etc. (even though I may agree with you)- because I will respond to you with that fact. I am not asking you to turn this current campaign into what I suggest. Not only would I have no right to do that, but I recognize it would be imprudent at this point. But for the future, I feel confident that this method I describe is God’s Will, or at least a significant part of His plan. Unlike Vivianne I have not yet taken this to expert opinions and spiritual direction. As always I submit this to those who are more qualified and learned than myself. But I hope you can see the wisdom in this approach, because this wisdom did not come from me; I do believe God put it in my heart. It is not the type of approach I would come up with on my own. And trust me, I resisted it for a long time. I am not saying it is the only valid approach to the exclusion of an explicitly Catholic one or an explicitly Christian one, but I do think it may very well be the best one. I anticipate there will be holier and better Catholics than myself who will disagree with me here; and I just ask that before responding they first pause and prayerfully consider what I suggest, because I will take their input very seriously. Consider that it is not my own ponderings, but striving after obedience to Heaven’s guidance that makes me say this. Consider that our allies in this battle are not limited to Christians. Consider that Mary clearly is the means by which God has chosen to bring about the renewal of faith that we so direly need. Consider what she HAS done and what therefore she can and will do. Consider that she is the woman spoken of in both Genesis and Revelation, and only by God’s grace, through Mary, do we have any hope in this age. When God sought to put an end to this continent’s Culture of Death almost 500 years ago, He did not do it through man’s carefully strategized efforts. 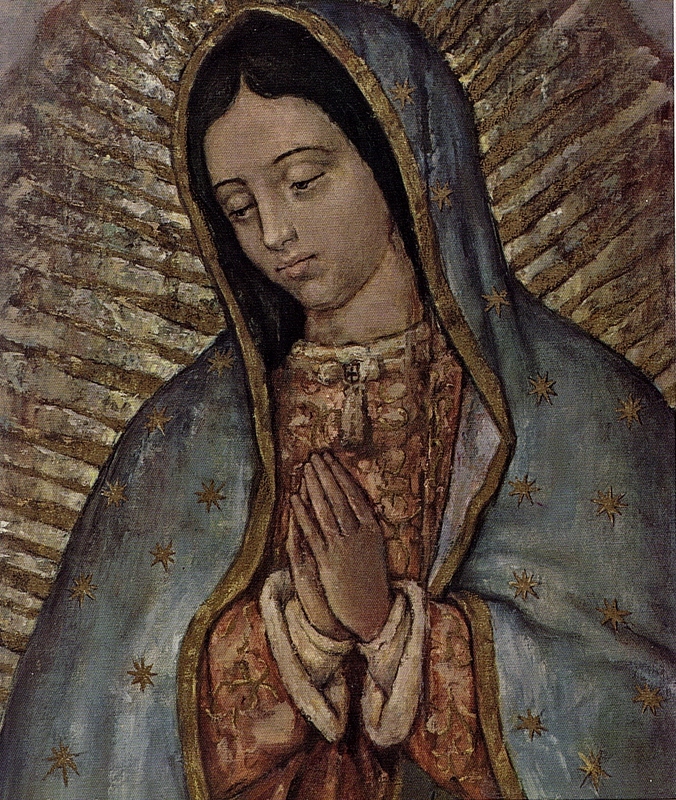 He did it through an apparition of His mother, as you all know, Our Lady of Guadalupe. It will not be different this time!